I received a gorgeous hank of Lion Brand Collection® Silk Yarn and have been just itching to use it. But I loved it so much I let it sit and wait for the perfect project. And I found it!! I learned a new knitting stitch and thought it would be awesome for showing off the beauty of this yarn and it did. I am so in love with my new scarf! 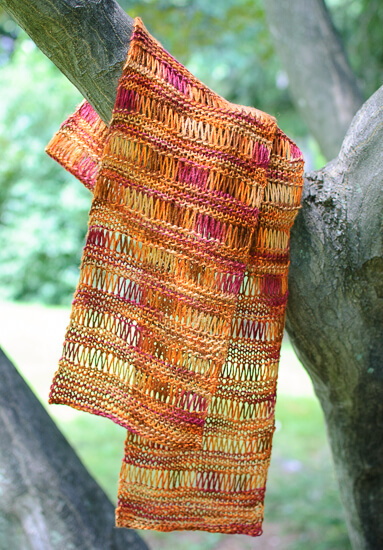 And of course I wanted to shared my knit scarf pattern with you, my fiber loving friends. 🙂 I hope you love it as much as I do. Finished scarf measures approximately 6.5 in. × 52 in. Rows 1 through 14: Knit every row. Row 15: Knit 1, *yarn over twice, knit 1, rep from * across. Row 16: Knit across dropping the yarn overs as you go across. Rows 17 through 22: Knit every row. Rows 23 through 230: Repeat Rows 15 through 22 twenty six more times or until you reach about 3 in. shy of your desired length. Row 231: Knit 1, *yarn over twice, knit 1, rep from * across. Row 232: Knit across dropping the yarn overs as you go across. Rows 233 through 246: Knit every row. Bind off stitches and weave in ends. Block if desired … you can find my free tutorial on How to Block Knit and Crochet Items here. I’ve just started this pattern and am soooo excited about it. I do have one question. The directions say Rows 17 – 22 Knit every other row What should I do to the row I am not knitting? Purl? I’m I’ve been making this scarf for years and have sold many of them. People see me working on one and I get an order for one in their favorite color. Fun. I Have a favorite stitch I use for a cowl you can also use as a hood. Great for cold weather. My design. I found a stitch I love and adapted it to a cowl. My first attempt to write a pattern. How are the yarn overs dropped? I have not come across the stitch/technique before. Hi Kay 🙂 You can just slip the yarn overs off the needle and it creates those lovely open stitches. I found I didn`t have enough yarn to make scarf as long as it should be. Now I have to buy more expensive yarn. I followed the directions exactly and used the same yarn as you. What is the problem? Hmmm. It could be that our gauge is different or that I blocked it longer. Did you try blocking it yet? You can get it right from the Lion Brand website. 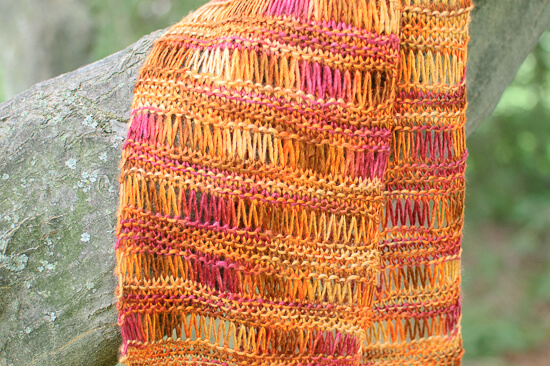 This is such a beautiful scarf – your pattern is a perfect fit for the yarn. Thank you very much for the pattern. I can hardly wait to get the yarn and knit it up! I have the perfect yarn for this. It, too, has been waiting for the perfect pattern. Thank you! 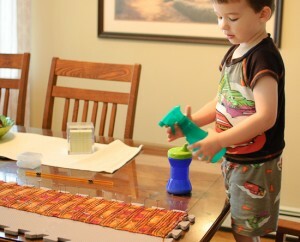 I have been looking for this pattern! My babysitter taught me this when I was a little girl and I’ve always wanted to try it but couldn’t remember how or what it was called. Thank you for bringing this lost gem back to me! It’s a beautiful scarf shame I’m unable to make it while trying to read it. My mother tried for years to teach me and I never got it. Now if it was a picture pattern oh yes I can understand that way. Wow! That is so pretty! 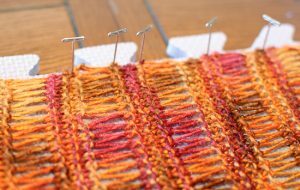 I am definitely going to try the double yarn over stitch because it makes it look so lacy and gorgeous. Thanks for sharing!